Criminalize Conservatism: Salon.com: "From Fox News To Rush: Secrets of The Right's Lie Machine"
Salon.com: "From Fox News To Rush: Secrets of The Right's Lie Machine"
"One key factor that has altered campaign coverage comes from the corporate right in the form of 'conservative' media. If there has been a vacuum created by the downsizing of newsrooms, conservative media have filled it with an insistent partisanship unseen in commercial news media for nearly a century. 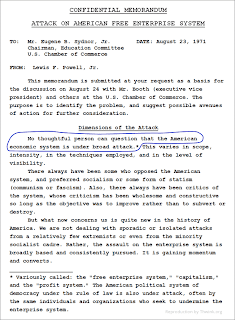 The conservative media program has been a cornerstone of the Dollarocracy’s — the big money and corporate media election complex — political program since at least Lewis Powell’s 1971 memo. Initially, the work was largely about criticizing the news media for being unfair to conservative Republicans and having a liberal Democratic bias. Although the actual research to support these claims was, to be generous, thin—one major book edited by Brent Bozell actually claimed corporations such as General Electric were 'liberal' companies with an interest in anti-business journalism because they had made small donations to groups like the NAACP and the Audubon Society—the point was not to win academic arguments. The point of bashing the 'liberal media,' as Republican National Committee chairman Rich Bond conceded in 1992, was to 'work the refs' like a basketball coach does so that 'maybe the ref will cut you a little slack' on the next play. "The ultimate aim of Dollarocracy was, as James Brian McPherson put it, 'to destroy the professionalism that has defined journalism since the mid-twentieth century.' The core problem was that professional journalism, to the extent it allowed editors and reporters some autonomy from the political and commercial values of owners, opened space for the legitimate presentation of news and perspectives beyond the range preferred by conservatives. That professional journalism basically conveyed the debates and consensus of official sources and remained steadfastly within the ideological range of the leadership of the two main political parties—it never was sympathetic to the political left—was of no concern. It still gave coverage to policy positions on issues such as unions, public education, civil rights, progressive taxation, social security, and the environment that were thoroughly mainstream but anathema to the right. Key to moving the political center of gravity to the right was getting the news media on the train, and that meant getting them to have a worldview more decidedly sympathetic to the needs of society’s owners. Newt Gingrich was blunt when he told media owners in 1995 that they needed to crack the whip on their newsrooms and have the news support the corporation’s politics. 'Get your children to behave,' he demanded in a private meeting with media CEOs. "The first decisive move came with AM talk radio." "In the late 1980s, conservatives moved from criticism to participation with the aggressive creation of right-wing partisan media. The first decisive move came with AM talk radio. The elimination of the Fairness Doctrine (which required that a broadcaster provide two sides to controversial political issues) and the relaxation of ownership rules such that a handful of companies established vast empires opened the door to a tidal wave of hard-core right-wing talk-show hosts. 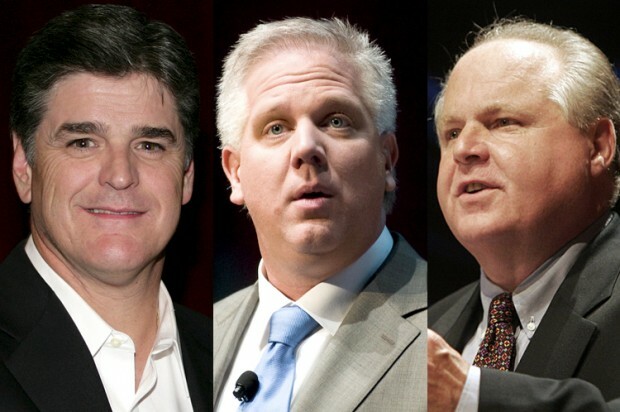 By the first decade of the century, the 257 talk stations owned by the five largest companies were airing over 2,500 hours of political talk weekly and well over 90 percent was decidedly right wing. "This isn’t your grandfather’s conservatism either. Although some conservative hosts, such as Michael Medved, can be quite thoughtful, just as conservative writers such as William Kristol will sometimes acknowledge when the movement has gone off the rails, the realists are in the minority. For a huge portion of contemporary conservative media, the broadcast begins and ends with the fear card, and it is often played in extraordinarily incendiary ways. Sure, some of the radio ranting comes from lightweights who are only trying to fill the three hours on the all-talk affiliate in St. Louis or Minneapolis. But the most effective purveyors of the venom are gifted and charismatic figures, such as Glenn Beck and Michael Levin, whose fire-and-brimstone moralizing is matched only by their willingness to bend the truth to support whatever argument they’ve decided to make that day. Across large swatches of America, and most rural areas where little journalism remains, right-wing talk radio is arguably the leading source of political information. "The undisputed heavyweight champion was and is Rush Limbaugh, who emerged as a national radio force by 1990 and who by 1993 was already recognized by the bible of modern conservatism, William F. Buckley Jr.’s National Review magazine, as an unmatched political power in Republican circles; the Review dubbed him the 'Leader of the Opposition.' 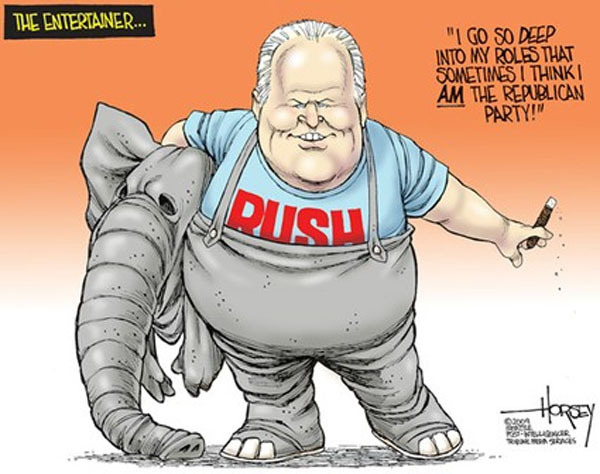 Limbaugh and his cohorts have the power to make or break Republican politicians, and all who wish successful national careers have to pray at his far-right altar or suffer the consequences. As Kathleen Hall Jamieson and Joseph Cappella put it, in many respects Limbaugh came to play the role party leaders had played in earlier times. "In the late 1990s, Rupert Murdoch launched the Fox News cable channel, and because television is such a ubiquitous and powerful medium, that put right-wing news media in the center of the mainstream. Michael Wolff characterized Fox News as 'the ultimate Murdoch product,' because it brought tabloid journalism to American television. What has been missed in the analysis of Fox News is the business model of tabloid journalism: dispense with actual reporting, which costs a lot of money to do well, and replace it with far less expensive pontificating that will attract audiences. For a tabloid news channel, that means the value added is a colorful partisan take on the news; otherwise the channel has no reason to attract viewers. Former CNN head Rick Kaplan told the story of how he was confronted by Time Warner executives in 1999 or 2000 who were dissatisfied with CNN’s profits despite what had been record revenues and a solid return. 'But Fox News made just as much profit,' Kaplan was informed, 'and did so with just half the revenues of CNN, because it does not carry so many reporters on its staff.' The message to Kaplan was clear: close bureaus and fire reporters, lots of them. In short, Fox News is the logical business product for an era where corporations deem journalism an unprofitable undertaking. "Fox News and the conservative media sector (including the conservative blogosphere) provide a 'self-protective enclave' for conservatives to cocoon themselves. Research demonstrates that the more a person consumes conservative media, the more likely she is to dismiss any news or arguments that contradict the conservative position as liberal propaganda and lies. Tom Frank argued that the point of conservative media is to facilitate a 'deliberate cognitive withdrawal from the shared world' by their adherents. Conservative media also, to a remarkable extent, stay on message, and the message is largely that of the Republican Party; these media, at least Fox News and Limbaugh, seem to march in lockstep with the same talking points, the same issues, and even the same terminology deployed across the board. They apply the core principles of advertising and propaganda. "Being a partisan player in the world of professional journalism has provided the right with considerable power to set the news agenda. Traditional journalists get their cues about what to cover from official sources and can dismiss some as ludicrous if they fail to meet an evidentiary standard and are opposed by other official sources. 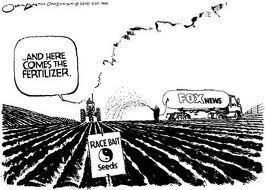 Fox and the conservative media, on the other hand, can reduce complex issues to one-word battle cries—'ACORN!' 'Solyndra!' 'Benghazi! '—which Republican politicians gleefully echo. Then those same politicians and right-wing media “watchdogs” badger traditional media for having a “liberal bias” if they do not cover the stories as well. By the time a hyperpartisan congressman like House Oversight and Government Reform Committee chairman Darrell Issa, a Republican from California, is gaveling hearings into session, the Washington press corps is not about to say, 'Hold it! This is ridiculous.' So it is that the nonstories that come to dominate news cycles invariably benefit the right. "But the right is never satisfied. Because they believe they are in an uphill battle with liberal propagandists, conservative media can have an unabashed and breathtaking double standard: they have very different evidentiary standards for stories that support, rather than damage, their politics. If facts prove inconvenient for the preferred narrative, ignore them. Republican officials are treated entirely differently from Democrats, even when the facts of a story are virtually identical. 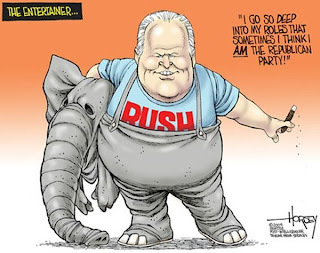 It is this opportunistic and unprincipled nature of conservative 'journalism' that draws widespread analysis and consternation from outside the political right and from those remaining thoughtful conservatives willing to brave the wrath of Limbaugh. 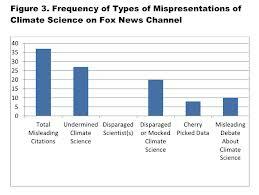 "Between the cocoon effect and the shameless disregard for consistency and intellectual honesty, it is not surprising that professional surveys tend to find regular viewers of Fox News to be more ignorant about what is actually happening in the world compared to those who watch other networks. In November 2011, Fairleigh Dickinson University’s PublicMind Poll examined how New Jerseyans watched television news, and the poll concluded that 'some outlets, especially Fox News, lead people to be even less informed than those who say they don’t watch any news at all.' In some surveys, to be accurate, Fox News does not rank at rock bottom in terms of audience knowledge. But on balance, it is the clown dunce of TV news. 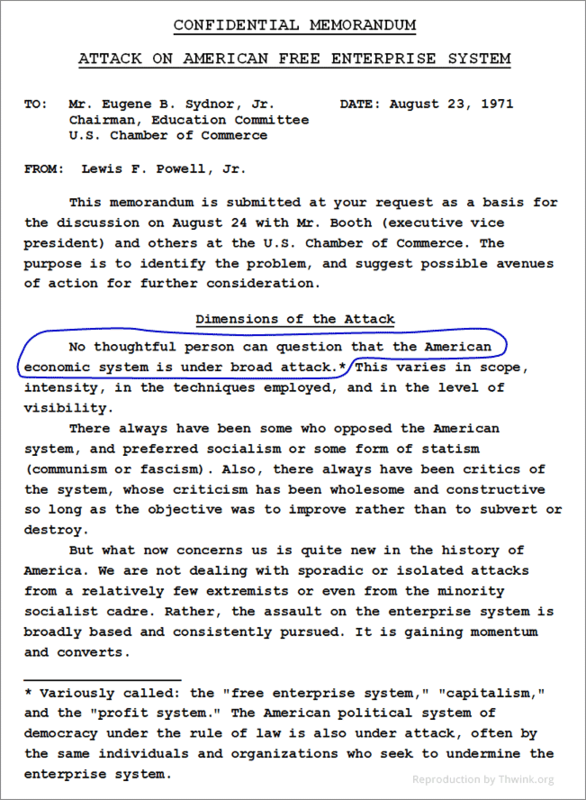 No other network ever comes close to getting the sort of assessment Fox News received from World Public Opinion, a project managed by the Program on International Policy Attitudes (PIPA) at the University of Maryland, in 2010. 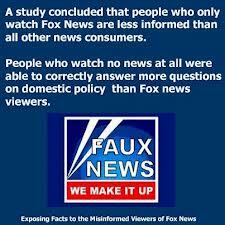 As one reporter summarized it, PIPA conducted a 'survey of American voters that shows that Fox News viewers are significantly more misinformed than consumers of news from other sources. 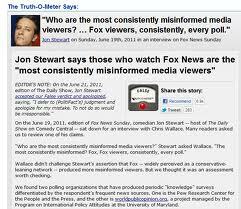 What’s more, the study shows that greater exposure to Fox News increases misinformation. So the more you watch, the less you know. Or to be precise, the more you think you know that is actually false.' As Theda Skocpol and Vanessa Williamson concluded in their study of the Tea Party, 'Fox News makes viewers both more conservative and less informed.' What may be most revealing is that there is no evidence that this finding bothers the management of Fox News in the least. "In private moments, conservatives concede they have won the battle to control the news, though to justify their modus operandi, they have to maintain and ceaselessly hype the shtick of being the abused outsiders battling entrenched liberal dominance. The mainstream of journalism has indeed moved to the right, in part because it has followed official sources to the right. Also the corporate news media owners, as Newt Gingrich understood, were certainly open to the idea of more probusiness journalism. The news media have made concerted efforts to appear welcoming to the right, unlike any similar welcome to the left. As Jeff Cohen, who has spent time in all the major cable TV newsrooms, observed, the greatest fear of working journalists is to be accused of being a liberal. 'Nearly all of the Clinton scandals,' McPherson noted, 'were set in motion by right-wing groups, floated through conservative media organs.' Rick Kaplan acknowledged as much and said he sometimes covered stories at CNN for fear of right-wing attack, not because they were legitimate stories. If professional journalism was resolute in splitting the difference between the two parties, there has been a greater price to pay for antagonizing Republicans in recent years. "The unraveling of media over the past two decades has driven many liberals, not to mention those to their left, to the brink of madness. Many are frustrated that traditional journalism has proven so incapable of resisting the right. With the success of Keith Olbermann’s on-air commentaries condemning the Bush-Cheney administration, MSNBC began to recognize that a lucrative market for low-expense, high-revenue programming was being underserved; it gradually put a few explicitly liberal programs on its schedule, which now includes boundary-breaking shows hosted by Rachel Maddow, Lawrence O’Donnell, Chris Hayes, and Ed Schultz. "Some have equated these programs with Fox News in style, imagining MSNBC as just a left-wing variant on Rupert Murdoch’s network, but the comparison fails upon inspection. 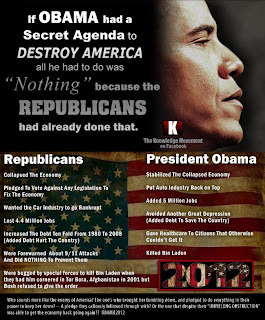 Although these programs are expressly liberal, they are more independent of the Democratic Party than Fox has been of the Republican—as was amply evident when MSNBC hosts were quick to decry Obama’s weak performance in the first of 2012’s three presidential debates. They also have a commitment to factual accuracy and intellectual consistency that is rare on the right. At the same time, as Olbermann and Cenk Uygur learned as they were shown the door, the corporate management has little sympathy with the politics of these shows if it veers too often outside the mainstream Democratic Party, even when the shows are profitable. There is an implicit pressure to rein in the politics. "Most striking is this: the explicitly liberal programs tend to spend considerable time fact-checking, debunking, and ridiculing the material on Fox and conservative talk radio. Right-wing media seem far less interested in what the liberals are saying. Why should they be? In the overall calculus, they are still calling the shots, and the liberals spend inordinate amounts of their time responding to the right. This call and response is a logical commercial manifestation of the post-journalism moment. 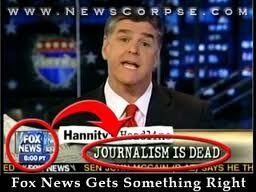 Neither Fox News nor MSNBC has its own teams of reporters to send out to break news stories. Slogans like 'We Report, You Decide' are rooted in fantasy. Cable channels have program hosts, producers, and guest bookers. They look at what others are reporting, and then they invite people to talk about the politics of the day. At their best, they invite interesting and diverse guests who might even disagree with one another—as happened on Ed Schultz’s MSNBC show during the debate about whether to include a public option in the Affordable Care Act. At their worst, they feature Sean Hannity and Karl Rove abandoning all the touchstones of realism and engaging in extended preelection discussions about how all the polls are wrong and Mitt Romney will win by a landslide. "VOTE THIS WAY" and the rest of the story are here --> http://www.salon.com/2013/06/15/from_fox_news_to_rush_secrets_of_the_rights_lie_machine/. "Excerpted with permission from “Dollarocracy: How the Money and Media Election Complex is Destroying America” by John Nichols and Robert W. McChesney. Available from Nation Books, a member of the Perseus Books Group. Copyright © 2013. We can't overly-recommend Nichols' and McChesney's book. A history of our capitulation to the Conservative propagandists is not as quite as far-reaching as the German experience, and Limbaugh and Fox News haven't been as quite as effective as Goebels in creating a totalitarian government on the level of Hitler's (yet) and our history is only second best in the history of partisan propaganda overwhelming a nation -- with the nation's permission. 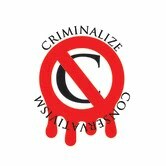 Until these right-wing vermin, propagandists for murder, theft, fascism, and other crimes from Conservative-sponsored causes, are wiped from the face of the earth or imprisoned, nothing will stop the right-wing extremists and their wealthy sponsors and fellow-travelers in their quest for a new American Feudal government. We've lost too many rounds not to go for a knockout before it's too late.